Gorgeous feminine type and elegance – I think our filly gets that from dad, Sir Gregory by Sir Donnerhall / Don Gregory – such a talented, charismatic dressage stallion, who really seems to stamp his get. I’ve been trying to get a Sir Gregory foal for years – and this match with Espinette has worked beautifully. 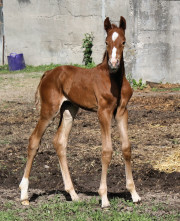 Espinette gives all her foals a very friendly, confident nature, along with good feet and excellent riding-horse points. 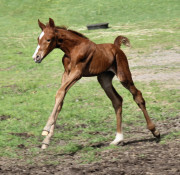 This wee girl loves to move, leaping and dancing – quite independant of Ma, straight away. The first videosnippet shows Sonnentanz at 2 days old; the second has her playing with her friends at about 4 months old. The photos are also taken at 2 and 3 days of age, then again at 3 weeks and one month old (conformation). 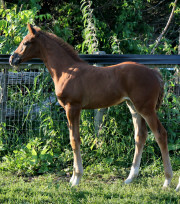 The last photo shows Stella at 3 months old, at her large (22+foals) Hanoverian Inspection. Update: On September 3rd our “Stella” attended the German Hanoverian Inspection at Parkwood, where she was named Co-Reserve Champion Dressage Foal, and top filly! She really showed off her big trot and impressed the judges with her elegance, type and beautiful frame.